LSSSDC is a not for profit organization, registered under the Societies Act, 1860. As a National level organization, in partnership with various stakeholders groups, it will serve to address the skill shortfalls in the Life Sciences Sector in India. It’s aim, over a 10 year period, will be to map all job roles in the Sector (estimated 100), enlist 339 Training Organisations, train over 39,000 Trainers and certify approx. 3.4 mn skilled workers in this Sector. The Indian Life Sciences Sector (comprising Pharmaceuticals, Bio Technology and Clinical) has been growing at a CAGR of 17%. In the process it has been facing a shortage of skilled work force across functions and levels. 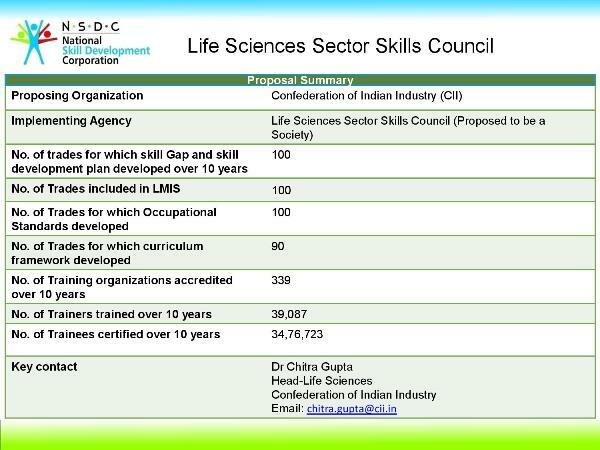 With this background, CII, in co-operation with NSDC, decided to set up a Sector Skill Council for Life Sciences namely, the Life Sciences Sector Skill Development Council (LSSSDC).